A common question that I hear from developers is “What is the market share of Firefox?” (or, more recently, “What is the market share of Firefox 2?”). There are a couple answers but generally you shouldn’t care about the results. How do you determine the global market share of a browser? It’s hard to give a proper answer to this – there are so many factors that go in to determining an exact global market share. How do you track users? If you’re tracking web sites, which web sites do you track? No matter how you look at it, it’s hard to pin these down. The Mozilla Metrics team has been blogging recently, discussing different ways in which market share can be evaluated. In a recent post breaking down the various metric services they looked at some of the most popular ones, analyzing their quality of data. One of the services that we make a lot of use of to get a decent global view of browser market share is Net Applications. Their data comes from a wide selection of sources and tracks over 160 million users. When someone is wondering what the global market share numbers look like, I generally point them at the Net Applications data. How do you determine the market share of a specific browser version? Again, Net Applications comes through well. They provide a data breakdown of browsers by version that works well. Thankfully the Mozilla Metrics team released a country-by-country breakdown looking at some of the locations where users are slowest to upgrade. Why you shouldn’t care about these numbers. The above global market share numbers should only matter to two groups of people: Browser vendors (it’s nice for them to be able to know how many people are using their applications) and generic tool developers (creators of libraries that could be used by any number of people in any locale). The problem is that most people don’t fall into either of these categories. 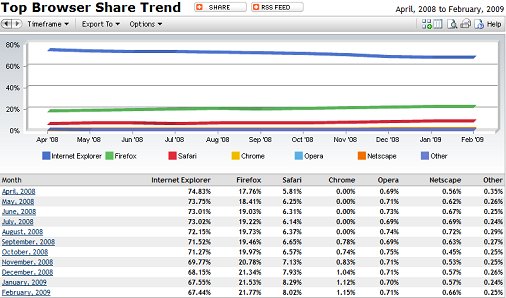 Instead, most developers should be monitoring one statistic: What is the browser share for my web site. In order to make smart decisions about what browsers to support for your web applications you need to, first, get an accurate picture of what your users are using – any other determination will simply be incorrect and will give you a skewed sense of importance. I talked about this balancing process last year, asking developers to balance the amount of work required to support a browser with the raw number of users that the browser provides. I also talked about this balancing process in my recent talk at Yahoo! : The DOM is a Mess. In fact, when determining what browsers to support for the jQuery library we use a mix of market share and intuition. We immediately support the major browsers – their current version, their previous version, and their next version. Additionally we extend support to older browser versions that still have significant market share (such as IE 6). Or you can even decide to have an influence on those numbers by joining campaign such as the “boycott IE6 initiative” or any action that would encourage your users to switch to a modern browser. It’s time for action, let 2009 be the year we gave up with IE6 support. But you get the data about your site’s browser breakdown only after you develop the site. You want the data before you build the app. In that case, you have to relay on the global browser market share. 1. Not every developer works on sites that are already up an running. Sometimes you develop for a site that isn’t already open to the public, so you have no idea about that. 2. These statistics about a particular site might be heavily influenced from development decisions that previous developers (or yourself in the past) took. For instance, if a site doesn’t work on browser X, then the percentage of browser X users for this site will be very small, regardless of it’s market share. If you only pay attention to these numbers, then this will never be fixed. Yes and no. What I mean is, you may use global statistics, but it all depends on who will, in the end, be your target market. If your target market is Big Corp ™, you’re likely going to have a higher-than-average IE6 usage, due to the well-known restrictions and slow upgrade cycles placed by big firm IT departments. If you’re going to be developing a meta-meta-meta-mashup for super web 2.0 webdev crowd, you may instead choose to stick a sign saying “We don’t support IE6” if the cost of supporting it is too big. In the former case, this would be economical suicide. So basically, use global statistics when you think you’ll have a normal user agent distribution in your site. If this is not the case, I’d recommend either looking for or asking for statistics from sites with similar targeted audiences as you. Isn’t the question people should be asking “What is the market share of Gecko 1.8.1.x”? Unless you’re developing an extension or some other form of content interacting with chrome, you really care about the rendering engine and its version, not that of the browser itself. It will be interesting to see the boost that graph gets from the release of IE8, and again when it is offered with a windows update. I’d go even further: the developer shouldn’t be paying much attention to what the browser stats are for their site at all, be it a new site (stats unknown), or an already running one. The reason for this is that any give site with a sufficient amount of visitors (doesn’t have to be a very high number), will eventually have at least a few visitors with every current-generation browser, and probably even with the previous generation browsers, as is always the case with IE6. That being a fact, developers don’t have much choice. Providing basic functionality for only 90% of the visitors just isn’t good enough, so you have to go higher, which means developing for 10+ different browsers at the moment. Things are different, though, if it’s about developing additional functionality above the base one. A lower percentage of coverage can be aimed for here, but the remaining visitors should nevertheless have an option to access the functionality in some way, i.e. with graceful degradation, or some other means. The reason FF3 is the most popular visitor to jquery.com is because jquery.com has had serious problems with IE7, I personally found the documentation section to be unusable under IE7. Checking the documentation portion of the site right now I can see that support for IE7 has improved… though the tab folders display wrong and sometimes the search magnifying glass is doubled up. Another annoyance on the jQuery site for IE users is that you have to click the Back button twice after visiting a help topic. I think it’s because IE adds the IFRAME for demos to the history. I wish we could make IE 6 go away by wishing or boycotting, but unfortunately, we can’t. We have a small but significant number of people who can’t/won’t upgrade their browser. Consider that IE 7 is markedly different in interface from IE 6. There is no low cognitive overhead upgrade path for those users. We actually have many users of our commercial product still on Windows 98, or for that matter XP service pack 1. We encourage our users to switch to Firefox if their on XP SP1, but that’s not an option for older Windows users since FF3 dropped support for old OSes. Attrition is taking these holdouts off the market rapidly, but I don’t think breaking functionality for them is going to seal the deal. These users are going to hold on till the machine dies – which, fortunately, is not that far in the future. I don’t think it matters much what the breakdown is for current browsers; as long as you’re a standards-aware webdeveloper you should be able to built a site that works well in every current browser and even in the previous major version of those browsers. The only exception to that would of course be Internet Explorer, and most particularly version 6 when it comes to supporting older major versions. IE7 and IE8 will probably score positive on the cost versus benefit scale even though these browsers are still lacking behind on standards-compliance, but IE6 is the one browser that will need consideration. Dropping IE6-support as a website doesn’t necessarily mean that the site will instantly stop functioning in IE6; you don’t have to remove all IE6 fixes from your code right-away, but you could point out to your public that new development will not be tested on that platform any more and that no support will be given. We always complain about geckoisgecko and yet the metrics team always reports on the market share of Firefox. Why not the gecko version and then include all the browsers (Firefox, Seamonkey, Fennec, Iceweasel, etc.) that use that version? I personally don’t care about Firefox but gecko as a whole…now that what should be reported. Not because that is what I care about but because that is what includes all the browsers using gecko. Sorry but I meant to put http://www.geckoisgecko.info/ in my last comment for interested people to look at an incomplete list of browsers use gecko. 1. Many non-Firefox Gecko browsers don’t use our primary data sources such as Blocklist or the older AUS, so those browsers are effectively invisible to us. 2. For the ones that we are able to collect metrics for, the percentage of traffic compared to Firefox/Thunderbird/Camino is so tiny that it is hard to ensure statistical validity. 3. The most useful thing it sound like you would like to see wouldn’t actually be coming from the Mozilla Metrics team at all, but rather from a company like Net Applications. In order for you to get coherent usage data for Gecko powered browsers, these companies would have to start performing analysis on the engine rather than the browser itself. I would certainly like to see this. It would be worth poking around to see if they have ever made any statements about their willingness to do so. Maybe some of them have already implemented it and I’m just not aware of it. God still so many IE users ! Seems Microsoft marketing is in progress … again … , watch their video named “Get the facts on browser performance.” ( check it very funny : http://www.microsoft.com/windows/internet-explorer/videos.aspx?mname=IE8_Perf_Test2 ). Why does Mozilla keep relying on liars? The obvious sub-text of this post is “when does it make business sense to stop developing for IE6?” As it turns out, more often than people may think. Now that IE8 was released I started using it and find it better than Firefox!! What do you say about that John Resig? that’s only for that particular site, with that particular audience. It is not representative of the rest of the web (nor is Net Applications, which is extremely U.S.-centric, and they keep editing their stats, bumping Opera down manually every time it eaches more than 1%). 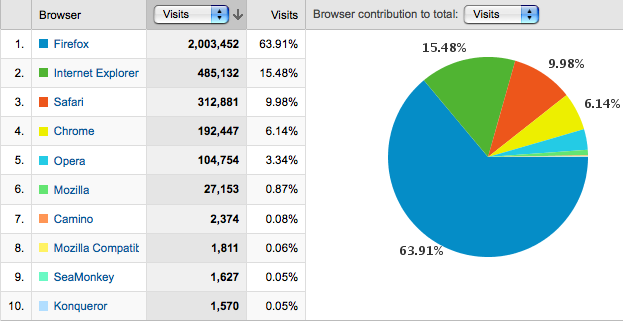 w3c browser stats are another example of a very skewed view of which browsers are the most popular. I hadn’t realised until now. @Glenn, w3schools != W3C! It has got nothing to do with the standards organization. Ha, I like the cost/benefit chart. 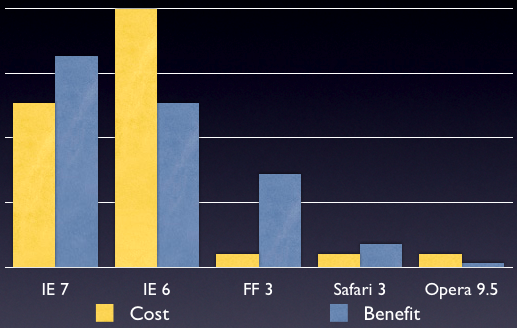 In our web dev organization the cost to support IE6 would be about twice as high. I actually have to leave the office and go home to test on a computer that can run IE6, and even then it’s in Multiple IE and not native. As for the IE6 question…What you *really* want to look at there is Win 2000 usage. My understanding (as a hobbiest, not prof web designer) is that Win2k can’t support any other (IE) browser. And from what I remember, back when I was running a computer repair/services company that focused on small business, we were routinely dealing computers that were running win311, win95, win98, winMe, NT (server and client), 2000, and XP. Anytime we talked about them upgrading they saw that as a way to “squeeze” more cash from them. Even though the repairs would have paid for a new system many times over.